English IPA vs. American IPA - What is the Difference? When it comes to IPAs there are certain aromas and flavor profiles associated with the styles within the category. English IPA vs. American IPA is the traditional pair in terms of comparison but it is only the beginning when it comes to the variety within the category and the increasing creativity poured into brewing IPAs. We sat down and tasted several IPAs in order to outline the key attributes of India Pale Ale across the most prominent styles. We usually do not taste craft beer in this manner and it was actually fun to compare styles in a sequence. Let me recap several facts from beer history. IPA is all about the hops. Hops were first thought (per recorded evidence) to have been used as a beer bittering agent around 820 AD in a monastery in Northern France. For centuries to come flavoring beer was common practice – it would otherwise be a super sweet and spoil prone fermented beverage. The typical method was using gruit, a blend of astringent herbs and spices such as rosemary, yarrow, juniper, heather, sometimes even dried fruit. The use of hops was not embraced by the British in beer making until the late 1700s. Their role was to both flavor and preserve the beer. At the time there was a style called October beer brewed by George Hodgson at his Bow Brewery. It had a higher alcohol content and was generously hopped. Known to last for months the style was a favorite for exports as it could survive long journeys through turbulent waters. Through a series of interesting events this style dominated the British beer exports (including to India) and later surpassed the popularity of porter in Britain. In the mid 1800s the extra hoppy pale ale became known as India Pale Ale. 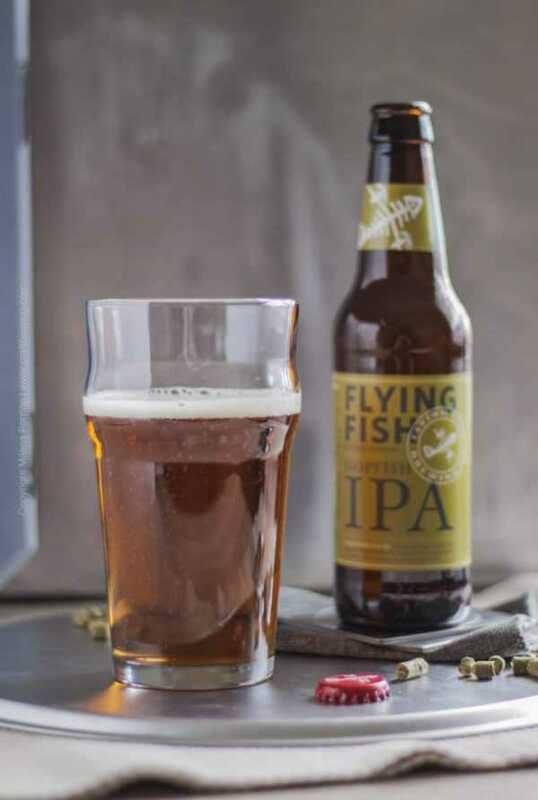 We picked Flying Fish Brewing Hopfish IPA as a representative of the English IPA style. It is considered to be one of the most true to the style ales brewed in the US. English IPAs have deep golden/amber color and are known for being very well balanced. They typically have strong malty character with dominant toffee, biscuit and caramel flavors. These are derived from the traditional English malts used to brew them. English IPAs are fermented by English ale yeast which brings about distinct fruity esters. 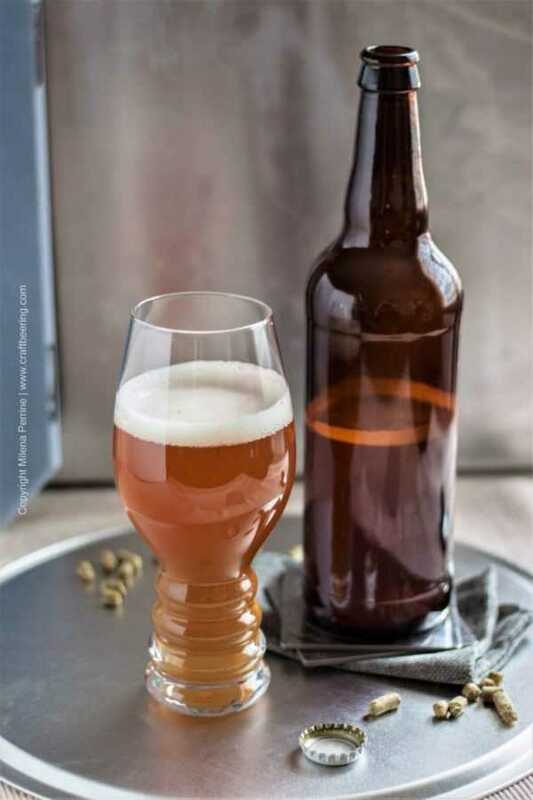 The hops used in English IPA contribute very specific herbal flavors that balance the sweetness through a controlled hop bite. These are hops low in alpha acids (bitterness), but highly aromatic. Traditionally English grown hops such as East Kent Golding were used, but today similar European varietals are common as well. The Hopfish IPA we tasted for example was brewed with a combination of European hops. English IPAs pair famously well with food and are really great partners to classic English cheeses such as Cheddar and Stilton Blue Cheese. Notable style examples are: Sam Smith IPA, Harpoon IPA, Shipyard Brewing Co. Fuggles IPA. American IPAs have signature aromas and flavors that are all their own. Fragrant and very bitter they deliver a drinking experience that has elevated them to the status of America’s best loved beer style. The aromatics and bitterness factor of American grown hops dominate and, in many instances, completely overtake the malty flavors in American IPAs. Some of them can be so unrepentantly pungent that they do in fact taste resinous and numb the tongue. There are however pronounced nuances when it comes to American IPAs. West Coast varieties are generally different from the East Coast ones. Furthermore, within the West Coast styles there are differences between the ales brewed in the South and those brewed in the Northwest. I know, a bit too much… The only way to really get a feel for the differences is of course by tasting a lot of different IPAs. West Coast IPAs are definitely not the style of beer to offer up to a craft beer novice, although for many it has been the very style that opened up the world of craft beer. In general though, most people are completely shocked by the level of bitterness that West Coast IPAs can pack. The West Coast IPAs brewed in San Diego and central California tend to exhibit a sticky bitterness and have strong aromas such as grapefruit, orange, lemons, pineapple and mango. The IPAs of the Pacific Northwest are better known for potent aromas such as pine trees and cut grass and have a more subdued bitterness. 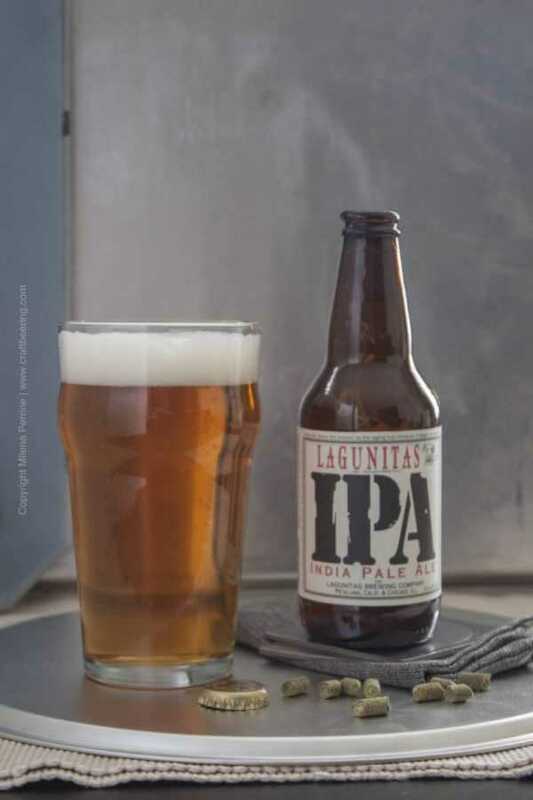 We picked Lagunitas Brewing Co. IPA which is made with 43 different hops. 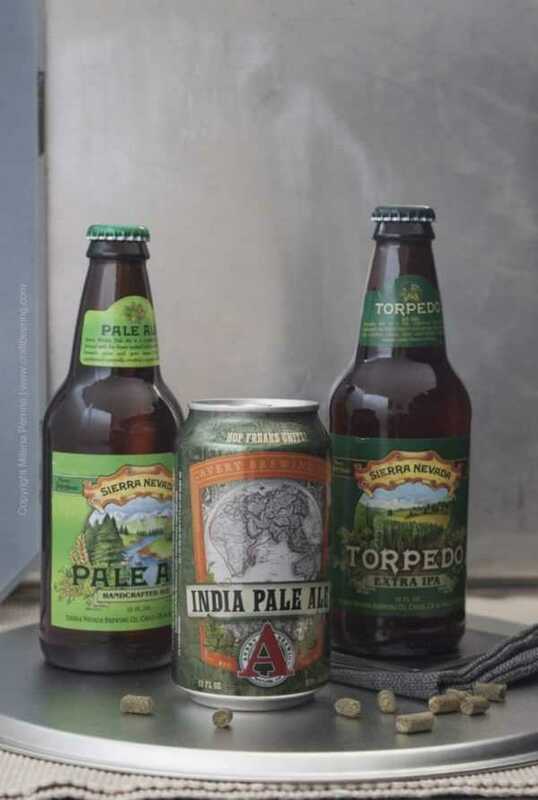 Other great examples of West Coast style IPAs include Stone Brewing Co. Stone IPA, Dogfish Head 60 Minute IPA, Sierra Nevada Torpedo IPA, … really, there are just so many out there. 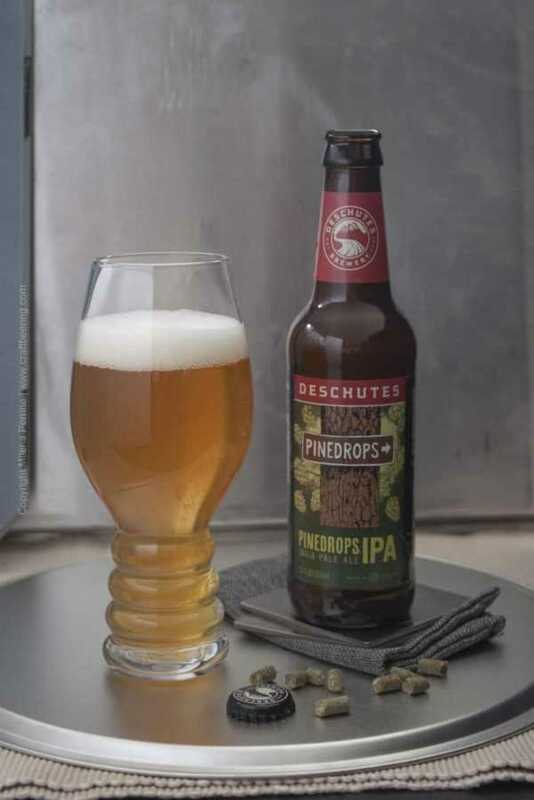 As far as Northwest examples are concerned, we like the creations of Deschutes Brewery in Bend, OR as well as Bridge Port Brewing Co. in Portland, OR. West Coast IPAs are amazing partners to Asian cuisine. One of our most favorite pairings in the whole world is Green Flash Brewing Co. Tangerine Soul Style IPA and green papaya salad with Chinese sausage. These IPAs do not have the same level of bitterness as their West Coast counterparts. In fact, their IBU is so low that they are more similar to the English IPA in that the zesty hoppiness is suppressed and balanced by juicy fruit flavors and an almost chewy mouthfeel. They are hazy and very aromatic, with intense flavors of papaya, melon and orange. Instead of a bold hoppy bite a creamy, fruity flavor coats the tongue. The yeasts used to ferment this style contribute beautiful esters (while yeast esters are downplayed with West Coast IPAs in favor of the hops aromatics). The NE style IPA was officially recognized by the Craft Brewers Association just recently. It had been (and still is) growing in popularity for awhile and most breweries are making a NE IPA or two as of late. It is also known as the Nebraska style IPA because it actually originated in an Omaha brewery. Funny how things work out in the world of craft beer. Chris recently made an amazing NE style IPA (below). It really turned out so well that we decided to include it as a representative of the style. The recipe he used was by WeldWerks Brewing Co. here in Colorado. Another official IPA style that builds up on the English IPA vs. American IPA relationship is the Imperial (Double) IPA. 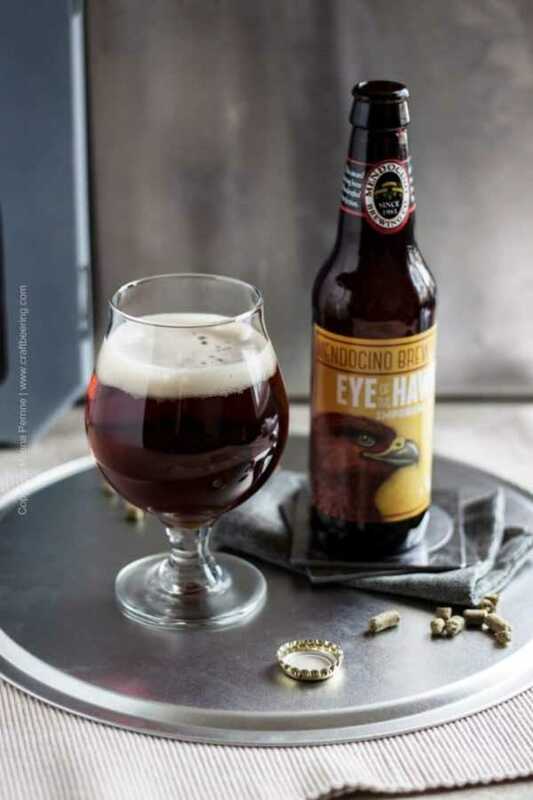 We picked Mendocino Brewing Eye of the Hawk Imperial IPA (below) as a representative. This style uses double the amount of hops and originated (you guessed it) on the West Coast. In order for the intense hoppiness to be balanced double the amount of malts is used as well, which results in a stronger ale with a pronounced alcohol warmth. In other words – boozy (ABV is around 10%). Imperial IPAs have a signature dry finish. Good examples of Imperial (Double) IPA include the original Russian River Pliny the Elder and our Colorado Avery Brewing Co. Maharaja. 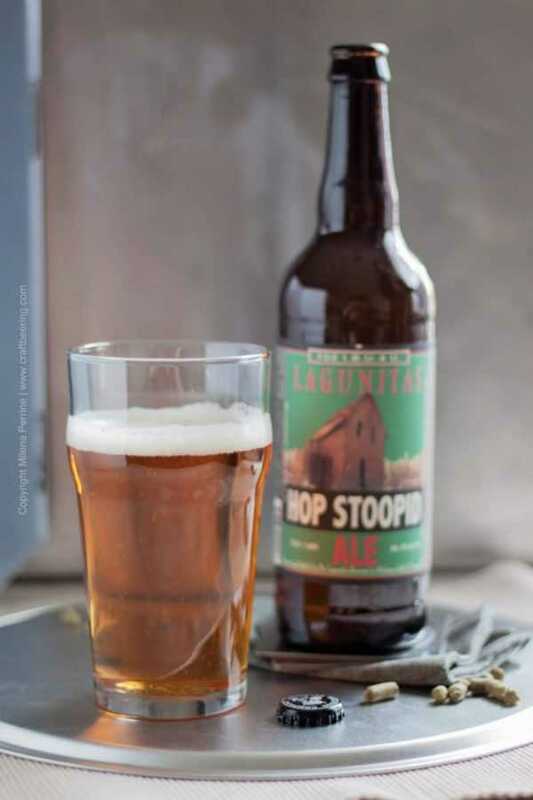 We also tasted Lagunitas Hop Stupid, which boasts a bitterness factor of over 100 IBU. It is thought that most people cannot perceive bitterness nuances past the 90 – 100 IBU mark, so draw your own conclusions here… Some people literally go crazy over beers like Hop Stoopid. There are also many other styles, such as Session IPA, Wild IPA, Black IPA, White IPA, Red IPA, Belgian IPA, Rye IPA… The obsession with the category is serious! Brewers have been experimenting with malts, hops and yeast and continue to cross the boundaries of the guidelines relevant to the traditional styles. The main line of reference remains between the traditional English IPA vs. American IPA (and its sub styles). I personally gravitate towards the English IPA, but I do appreciate the New England style American IPA. Chris is much more of a fan of West Coast IPAs than I am and also enjoys the New England style. Overall though, runaway IBUs are not our thing. And we are fine with that. It is really fun to taste IPAs to compare styles. Even though there are defined aromas and flavors within each style or sub-style tasting the same style across breweries is always, always an adventure and the beers often have substantial differences. Often times you notice variations that transcend style definitions – one brewery’s West Coast IPA could taste much milder than another brewery’s traditional pale ale. I had no idea there was so much to know about IPAs! (This should come as no surprise.) As a West Coast native, the section on WC IPAs is especially interesting :). Have a great weekend, Milena!